The thing that interested me in genealogy to begin with was this desire to know who I am, what I'm made of and where I came from. I started with this really general research into the origins of humans, which ended with 'humans migrated to various places across the earth at various times'. Then I picked up about 700 years ago in Europe with my earliest known ancestors with genealogy. Between the two - 700 years ago and a few hundred thousand years ago was this really big gap of ... "Eh, Who Knows?!" So, one of the most compelling reasons I wanted to get my DNA tested was to find out what my mitochondrial Haplogroup is - and, in turn, to have some idea of how my ancient ancestors migrated across the earth's surface, and in turn, what their lifestyles were like. Its one thing to know, in general, that some male and female somewhere got together to have babies, who had babies etc and that's how our species came to be - but something else entirely to know where my ancestors specifically, fit into the advent of agriculture or the use of iron or how they helped carry their culture from one place to another. I got my dna analyzed via 23andme.com. They do two forms of analysis that was applicable to this particular research into myself. They will tell you how much of your DNA is neanderthal as well as what your maternal haplogroup is. 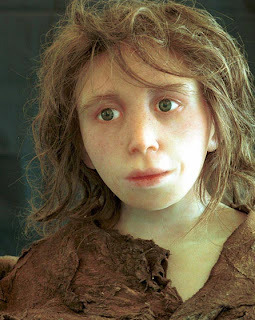 Neanderthals were these humanoid folks that were really closely related (although not ancestors) to modern humans. We are Homo Sapien Sapiens, they were Homo Sapien Neanderthalensis (or Homo Neanderthalensis). We have tons of neanderthal fossils. And by 'we', I mean scientists that know what to do with such things. Not too terribly long ago - only a few years - it was discovered that modern humans have a touch of neanderthal DNA in them. I will say that there seems to be quite a bit of dissention over how that DNA got into us humans. Some say hey maybe only the males of one species were able to mate with the females of the other and only the female offspring survived. Some say, if it happened, it was rare. And some insist it never happened and instead, the Neanderthal DNA that we have in us is actually the DNA from a third, common ancestor. At any rate, only this year, the first fossils thought to be a hybrid of neanderthal and modern human was found. Cusp of science and whatnot and 23andme is able to analyze for it. So the first cool thing I found out is that I have 2.8% Neanderthal DNA. By whatever means neanderthal DNA made it into my DNA, I can now reasonably explain my eating habits and my son's bedroom. But even cooler was to discover that my mitochondrial haplogroup is T2f1. Ta da! Exciting, right? Those four characters tell me how my ancient ancestors migrated across the earth so that I, Carrie, wound up here, where I am. You know exactly what those four characters mean. Right? Hah. Neither do I. I'm still piecing together my specific history - but in the mean time, here is some stuff about Mitochondrial Haplogroup where it intersects with ancient history. I should preface this explanation by saying that I don't cite scientific sources (as opposed to wikipedia) here because it is not a scientific explanation. My understanding of this process has been an evolution from many sources over time and is extraordinarily dumbed down into plain English from the science-ese that I found it in. So, 1) what I understand could be incorrect and 2) what we know now could change given a couple of years of study. I encourage you to read up on all of this and draw your own conclusions. This wikipedia article does a good job of explaining the most recent common ancestor in different words than I do but also in plain english, as well as some of the unknowns. Right now, every single human has fragments of DNA from every single ancestor that was directly involved in creating them. It's fairly common knowledge that we are able to determine blood relation by comparing the DNA of two people for similarities. That's how paternity tests are done. What I didn't know is that although I might only share most of my DNA with my sister and mom and dad, I also share tiny chunks of my DNA with large groups of people. In my case, all people who are in the T2f1 or T2 or T haplogroups - are really distantly related to me. We have snips of DNA in common that people in other haplogroups don't have because we all have a common ancestor. T2s all have a common ancestor and that common ancestor had a lineage back to the T common ancestor etc. I didn't really understand Mitochondrial Eve until I looked at it kind of reversed - from the bottom up. Starting with us and looking backwards. I thought to myself "surely there was more than one female at the time of Mitochondrial Eve"! And there was! There were lots of other females. But Mitochondrial Eve was the only one to create enough viable offspring to have her genetics survive to today. The others just failed to do so. Had we done this level of DNA testing 10,000 years ago, we might have found more than one female common ancestor on a parallel level to our Mitochondrial Eve or maybe even female ancestors that predated her. So, Mitochondrial Eve wasn't the only female alive. She was just the one that was the most prolific with the most viable genes. And all of the common ancestors that we are aware of now (there are 10-12, I think, now, although that seems to be evolving as we learn more... and by 'we', I still mean scientists that know what they are doing.) that descended from Mitochondrial Eve were only some of the women that lived. There are still lots of unknowns. For instance, when did Mitochondrial Eve live? Although we know DNA evolves, we aren't sure how quickly yet. There are lots of different models for how DNA evolves and each model comes up with a slightly different 'age' for Mitochondrial Eve based upon how long that model proposes that it took for our DNA to evolve between each stage of it's evolution. Was Mitochondrial Eve human? It's possible that she wasn't! Right now, "she" is just a snip of DNA that we all have in common. Plants and animals also have DNA. She could have been a fish or a primate - or a plant? We know that group L0 and L1 (the top of that tree) are human - but because Mitochondrial Eve amounts to a snip of DNA included in the group L DNA rather than a complete DNA sequence, we don't know conclusively what she was. Was there an Adam and when did he live? There are many Adams, thus far as opposed to the single common female ancestor we have now. Why? Many unanswered questions. BUT! What we know is : we all have this common mDNA gene snip, we are sure that mDNA is passed from mother to child, that all children have it from their mother and we are sure that DNA changes over time in the course of those 'passings'. So, Mitochondrial Eve isn't a specific person. She is a concept of a living female being that passed some DNA on that we can only conceptualize based upon what we (scientists who know what they are doing) know by looking at DNA and how it evolves over generations. And even better, even with all the unknowns that data can be set alongside archaeological data - actual bones, fossils and artifacts and we can start to put dates around where ancestors were at what times. Which is how approximate haplogroup migration paths are determined. We're talking tens of thousands of years here so it's not an exact science yet. But new discoveries are made with increasing frequency. I'm excited at what will be able to be learned in five or ten years. Hi. I'm T2F1 and VERY neanderthal. Thanks for the article!